Osborne offers thousands of products; from heat pads and accessories to turn-key solutions. Hog farmers know a pig’s environment is one of the key components to produce optimal conditions for pig production. The importance of swine health as it relates to pig body temperature range should not be underestimated. Pigs are a highly adaptable animal and can perform well within a range of temperatures known as the thermoneutral zone (TNZ). The TNZ for a pig is that temperature in which the animal can maintain its normal body temperature and control heat loss. What is the normal body temperature range of a pig? Normal body temperature range for an adult pig is 101.6 – 104 °F (38.7 – 40 °C). But more than just body temperature needs to be considered in order to increase yields and make pig production as efficient as possible. Ways that pigs control their heat loss is by regulating their blood flow, huddling together in groups or burrowing into the bedding. Temperature control is important for production. Above all, pigs cannot thrive outside of the TNZ. A pig’s inability to maintain its body temperature could result in its death. If temperatures in its environment fall below the TNZ, a pig will feed more but in doing so expend more energy to stay warm. The result is slow and inefficient growth. On the other hand, a high temperature environment can be problematic, too. For the most part, pigs handle the cold better than the heat. Hot weather will adversely affect pig production more than cold. Pigs do not sweat, but they do pant. When a pig pants it means that the animal is experiencing heat stress, which is big trouble for a breeding herd. Heat reduces feed consumption. 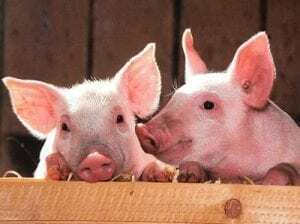 When pigs eat less, they grow and mature slower, which lowers the conception rates of the herd. Pig flow can be disrupted and your stock could be reduced. When the temperature falls, pigs huddle and their feed consumption increases as they reach their lower critical temperature (LCT). To achieve optimal pig growth during winter a proper heating and ventilation should be in place within a well-insulated building. This is especially important for piglets, very young pigs, and small pigs. Pigs are born with little fat and therefore, have no natural insulation to protect themselves from the cold. They cannot survive long outside of their TNZ. Therefore, the farrowing house becomes a very important part in the overall pork production. It needs to be draft free, well insulated, and include proper heating in the piglet zone. Though the temptation is great, hog farmers should avoid constructing low-capital cost barns to raise their pigs in. Keeping young pigs warm is critical for their survival as well as for maintaining steady production of the herd. Piglets should be kept at a higher temperature than adult pigs, which presents a problem since they will have different temperature requirements than a sow. Some hog farmers will use heat lamps in an attempt to keep their piglets warm during the cold months. This not only produces uneven heat distribution within the pen, but will increase energy costs. In order to maintain the right surface temperature for the animal, and also maximize energy savings, heating mats are an effective strategy for optimal pig growth. Heat pads are designed to provide the best possible environment for your pigs to grow in and reduce temperature related stress. Heat mats help better regulate piglet body temperatures than lamps and also keeps heat away from the sow for her to remain cooler and more productive. Osborne has been trusted by professional farmers for decades. We provide superior heat pads, pig feeders, small animal scales, ventilation systems, and more, so you can focus more on production and worry less about equipment. Copyright © 2019 Osborne Industries Inc. All rights reserved.